JULY 8, 2017 — Jay Abitz is the auto shop instructor at Freedom High School in Freedom, WI. Jay started teaching at the school 10 years ago. Jay has developed a program that keeps up with the modern auto repair industry, but also involves older cars. Jay is passionate about his goals and skilled at communicating them to others. Outside his shop is a wall covered with framed copies of articles about his program in both local and national publications. A Hot Rod magazine article talks about a model car build that his students participate in at a car show. This involves members of the Freedom High School Auto Club that Jay Abitz founded. At the NEW Motorama show in Green Bay, teen-age members of the Freedom High School Auto Club help younger kids build model cars out of aluminum. The kids watch the model cars being formed, then crimp and trim them and add wheels with guidance from the Freedom High School Auto Club. Now the model car build has led to a bigger new project in which the Freedom High School Auto Club members may wind up building a SEMA show car. 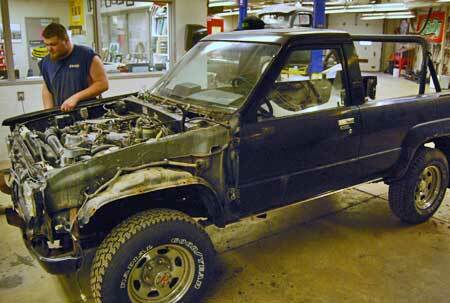 Rick Paulick, who runs NEW Motorama, has donated an old Toyota 4Runner to the club. If all goes according to plan, the truck will be turned into a rock crawler that will be displayed in the Sherwin-Williams booth at SEMA next fall. Cole Woods checks out the front suspension of the Toyota 4Runner. The truck has Wisconsin rust issues, especially in the rear wheel wells. "First, we're going to go through the 4Runner to make sure it's mechanically sound," Abitz explained. "We'll do a coolant flush, change belts and clean it up a little bit. We're going to be putting in a lift kit donated by a company called Truedell Performance. Then, we'll work on the off-road, rock crawler look." 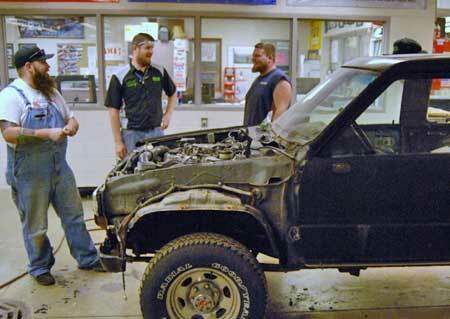 Being a Wisconsin vehicle that saw year-round, everyday use, the 4Runner has some rust issues. "We're going to be doing paint and body work, as well as mechanical stuff," said Abitz. "A lot of sheet metal will be fabricated by our students and others who will help us. The paint will be donated by Sherwin-Williams — one of my biggest supporters. They sponsor us through the Collision Repair Educational Foundation. They'll be donating the base coat, clear coat, primer and all that, as well as most materials like filler, etc. ; whatever we need." Abitz is thinking about a basic off-road interior that will require minimum work and expense. "We're thinking a 5-point harness, racing bucket seats and things like that," he said. "Not a ton of flash in the interior; more of a utilitarian look. And once we get the body and paint work done, we'll clean up the frame and do an undercoating. 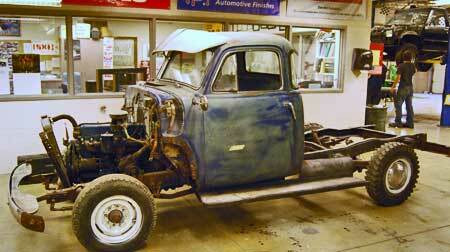 We'll probably use a Sherwin-Williams bed liner product underneath the vehicle and inside the chassis on the floor." Tim Van Veghel seemed to scratch his head after checking the underside. The initial plan is to have the students and other people willing to help meet on Wednesday afternoons and evenings to work on the 4Runner together. 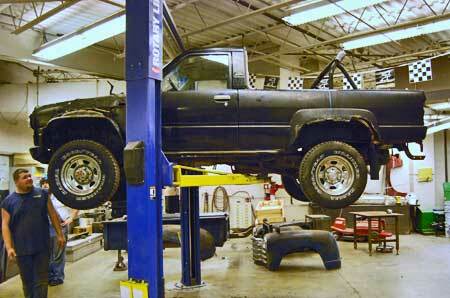 With the school year factored in, the transformation of the truck is targeted for "Octoberish," according to Abitz. "Since we start off a new semester in September and we have to have it finished by October (to make it to SEMA,) it probably has to be mostly done by August. The people who will be working on it are mostly members of the club, including about 40 current students, but we'll also have alumni, local gearheads and a number of professionals helping out." Abitz said that the local support in Freedom is very strong. "My dad, Robert Abitz, actually started the auto shop program here in 1972 and ran it for 35 years," Abitz explained, "back in the day, when my dad was in my role, they worked on daily drivers. They did students' cars and teachers' cars and community members' cars. When I started teaching, 10 years ago, we had a chance to do some restorations on vintage vehicles from the '60s, '70s and '80s. We've done over a dozen for sure. We've done a lot of muscle cars — Mustangs and Camaros — cars that the kids really get into more than everyday drivers. " 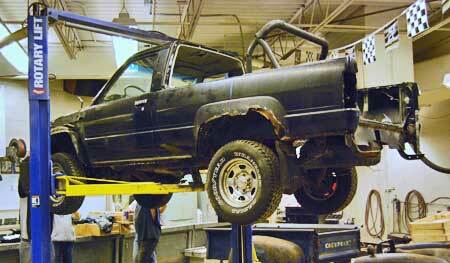 Another Freedom High School Auto Club project is this Chevy pickup. In 2009, the auto club members had a unique opportunity to work on a one-of-a-kind car build by eccentric inventor Bruce Mohs. The Mohs Ostentatienne Opera Sedan was originally built in 1967 and only a single example was made. Around 2008, former teacher Fred Beyer of Hot Rod High USA became friends with Mohs (who has since passed on) and arranged to have his car restored by the Freedom High School Auto Club. This was the first project that got the auto club national exposure. Between father and son teaching auto repair for 45 years and articles about the auto club in national magazines, the small burg of Freedom has become a car town. "People say that if you drive through Freedom on a summer day, you'll see garage doors open and people working on cars," Abitz noted. "We have had a number of students go directly to work in body shops," Abitz said. "We have also had a good chunk of kids run car-oriented businesses or sideline businesses out of their homes. A lot of others go into industry as welders or sheet metal fabricators. Those are their day jobs and, at night, they work on cars. 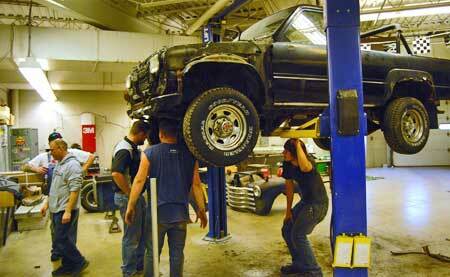 Others go on to be mechanics or find jobs in the insurance field." Justin Hendrickson (l.) and Cole Woods (r.) get advice from Jay Abitz (c.). The more Cole Woods took off the truck, the more problems he saw. Abitz said that the idea of having the kids build a car to exhibit at SEMA was Rick Paulick's vision. "It's his idea and he lined the vehicle up for us," the teacher explained. "Then we started working with Sherwin-Williams to get it ready for SEMA and actually put it in their booth at SEMA. That's our goal right now, but we really haven't worked out all of the details on this yet. Rick has lined up some local shops that are going to offer us some expertise and labor. They include Truedell Performance, Auto Ace and a few others. So, we've got a lot of people involved and we're planning to get this done with lots of help." Abitz admitted to Second Chance Garage that the timeline is tight. "It's going to be a tough deadline," he said. "We have committed to the SEMA project and we're going to get it done. We'll know by the end of July where we're at and what it's going to take to get it done. We'll know if there's 50 hours left or 100 hours left or 1,000 hours left. So, that's going to be our checkpoint to gauge whether we're on track to get it done or whether we need to kick into high gear." Jay Abitz (center) thinks the build can be completed by August. The team working on the car in late May included (l. to r.) Tim Van Veghel, Trevor Hintz, Cole Woods, Justin Hendrickson, Jay Abitz and Rick Paulick. In prior projects, Abitz did not write estimates of how many hours a job might take. "However, the labor hours involved in this SEMA project are obviously related to the number of people we'll have working on it," he advised. "We know from past experience that these jobs take a lot of time, so I'm hoping to trim down the time with the amount of helpers we have. Of course, professional assistance will help, too. If we get some of those guys to pitch in and give us direction, I'm sure that will speed up the process, too."